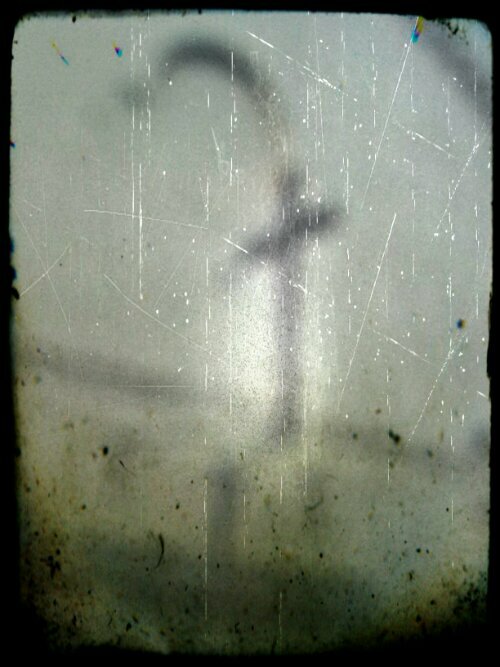 Headed off to Whitstable for the postponed day out. First hurdle was that when we arrived we didn’t have any change for the car park, however the local council has thoughtfully equipped the machines with the ability to pay the 70p per hour that they charge 7 days a week by card – so that’s what I did! Much to Sarah’s disgust I wore the tweed jacket and in the first shop we went into there was someone else wearing one! Judging by his appearance I would say that his probably cost more than £4.99 on ebay but I didn’t care as it wasn’t the kind I would have bought or worn anyway! 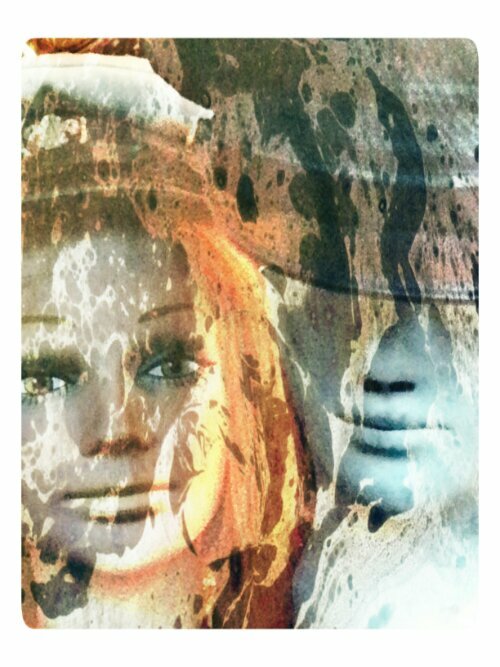 I noted that his hair was immaculate and he appeared to be wearing a cravat but…………..he was in a charity shop!!!! We normally go to a certain fish and chip shop in the main street but it’s usually very busy and today was no exception. 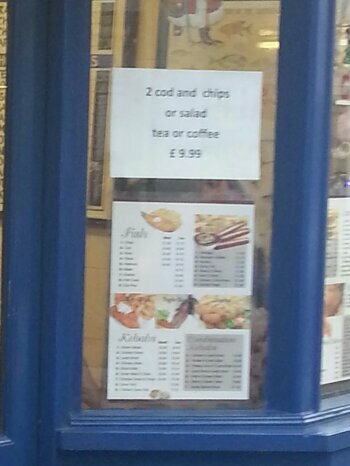 It’s also quite expensive so when we saw this sign in a window of another chip shop we thought we’d go there instead. Sarah and I both had Fish and chips and Ben had a burger. However when we went to pay it came out much higher than we were expecting! I asked him why he hadn’t charged me the £9.99 advertised on the window and he mumbled about how it was a special deal and if he’d known I’d wanted it he would have given us a smaller fish blah blah blah. I was explaining what he’d said to Sarah when another lady heard and said that she’s ordered the same based on the sign in the window. I then decided to argue the toss with him and threatened that if he didn’t refund me the additional £2.50 he’d charged us I would take photographs of the sign and report him to trading standards on Monday. He grudgingly handed over the cash! 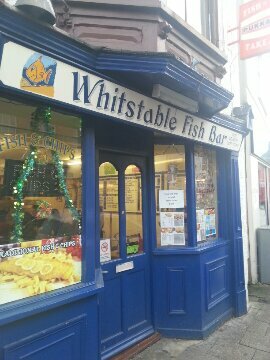 So beware if you’re in Whitstable and pass this fish and chip shop. After we’d eaten we walked down the high street and headed for the beach so Ben could throw stones into the sea. It was starting to get very cold by this point. I was beginning to regret wearing my tweed jacket which isn’t big enough to fit a jumper underneath. 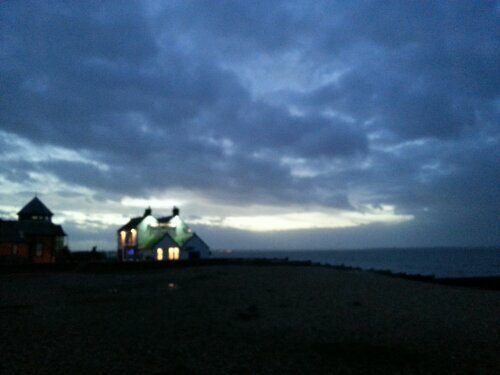 As it was getting dark we headed back to the car and drove home.